Open your mouth, let the words fly out. In Annie Dillard's The Writing Life (my Bible while I'm here) she writes that poet Saint-Pol Roux used to hang a sign on his bedroom doorknob at night while he slept that read: The poet is working. I now think that's possible! Simply being here is jump starting my creativity. I awoke this morning with poetry oozing out my ears. (Please don't take that sentence into account if you're looking for proof!) So far, though, I can't tell if it's because I'm in the process of rebooting my brain and all the literary power and history of Boston and Cambridge is on my side... or if it's simply that I am one of those students who wants desperately to please her professors. Am I inspired or intimidated? My night's sleep was rocky and not nearly long enough, but I was excited to begin the first residency of my first semester! I showered and attempted to blow my hair dry. In this humidity, drying anyone's hair is an arduous process, but mine is especially thick and requires extra effort. Ill-prepared for such a task so early in the morning, my arms quickly tired, and when my right wrist sagged under the fatigue, the back of the hair dryer snagged a clump of my hair and wound it up tight in the motor! I pulled it as far away from my head as possible and fought to switch it off with my thumb. When the motor finally whirred to a laborious stop, I cringed. A massive clump was knotted through the guard and around the blades. Still supporting the heavy dryer with my right hand, I fished in my toiletry bag for my pair of nail scissors. (It's funny how decisive I can be in a strange bathroom when death or injury is the line.) In seconds I was free of the clump and the dryer. When I turned it on again, the blades groaned and picked up speed. A swirl of white smoke nosed its way up toward my nose and the acrid smell of burnt hair filled the bathroom. I opened a window and continued the drying process, this time making certain I was clear of the wretched motor. Clean, dry, and clad in something summery, I swung my bag over my shoulder and went out to explore the campus. It was, in a word, a perfect day in Cambridge. Only 80 degrees and with low humidity. Tiny, fluffy clouds sashayed through the clear blue sky. Birds twittered in and behind and under the branches of a bush sagging heavily under bunches of blue hydrangeas. For the first time, I saw my dorm. A greenish-gray building with a broad, white front porch. I stepped back to take in the whole façade and tripped over an empty bike rack. The top piece connected with my kneecap and sent a hearty twang echoing down Wendell Street. Tears popped into my eyes as I swallowed the pain. It was almost enough to make me want to retreat back into my nice, private, air conditioned room, but then my phone was ringing. Jonathan! He was about to board his plane to San Diego and wanted to say good morning. How was I? "Bruised," I said. "But I can't wait to see everything in the daytime!" A Starbucks iced tea soothed me. I snapped photos of the Lesley campus and the Harvard campus. After about an hour of exploration, I found myself in the middle of the same quad I'd visited the night before. In the shade of a tree, I surveyed the walls of my new school. Green and white banners hung from every rafter. Green and white balloons danced in the breeze above banisters leading into the Student Center and the Cafeteria (White Hall). "Excuse me," a girl pulling a suitcase said. "Do you know where the Public Safety Office is?" Less than 12 hours had passed since I was the wandering student with her belongings rolling behind her, and already I appeared knowledgeable! "Sure," I said, obligingly. "You're almost there." I walked her to the office and waved goodbye, certain I'd see her later at our orientation. The heat began to wear on me, but I wasn't through exploring. My parents visited the Boston area a couple of summers ago and had all kinds of advice on where to go and what to eat and what to visit. One of the key things on their list was the home of Henry Wadsworth Longfellow, one of America's most famous poets. He penned the epic Evangeline and the famed Paul Revere's Ride . His home, I was happy to discover, is only a fifteen minute walk from Lesley. I skirted Cambridge Common and found my way to Brattle Street (where Lesley has its library and other offices and classrooms). There, set back from the road beyond a row of regal hedges, was Longfellow's house. Lemon yellow and bedecked with an enormous American flag, it was every inch the home of a patriot. While I didn't have time for a true tour, I did grab a brochure and read it as I wandered the gardens. Before it belonged to Longfellow and his wife and children, the home had been the headquarters of General George Washington during his siege on British-controlled Boston, in 1775. I'm a sucker for all things Revolutionary War, so one day I hope to take the time to marinate in the patriotic history of this area. Unfortunately, this MFA program leaves little time for sightseeing. That much was made clear from the moment orientation began. This is an intensive 10-day residency. We begin seminars and workshops tomorrow morning at 8:30. Our schedules are full all day, every day through next Saturday, July 3, when we will likely collapse from exhaustion before returning to our separate homes to work for the semester remotely. 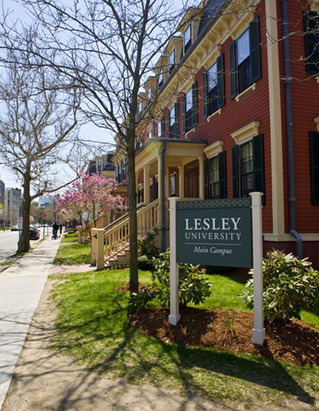 The heart of Lesley's MFA Creative Writing Program, our faculty mentors and visiting writers include two former U.S. Poet Laureates; former fellows from the Mary Ingraham Bunting Institute of Radcliffe College; recipients of the Commonwealth Prize for Poetry; Canada's Governor General's Award for Literature; Guggenheim fellowships, NEA fellowships, the Norma Farber First Book Award, The Parents' Choice Award, the Parenting's Reading Magic Award, Pushcart Prizes, Whiting awards, numerous state arts council awards, Ingram Merrill Foundation grants, the PEN Discovery Award; and winners of or nominees for, the National Book Award and the Pulitzer Prize. Books by many of our faculty mentors have been named "notable books" by The L.A. Times, The New York Times, and The Washington Post. In addition to their books, members of our faculty have published their work inThe Atlantic, The New Yorker, The American Poetry Review, New York Times Magazine, Antaeus, Paris Review, Smithsonian, Poetry, The Nation, Grand Street, Kenyon Review, Best American Poetry, The Best American Essays, Triquarterly, and many other important journals and anthologies. And the further good news is that they want us to write. To read and to write. To critique what others have written and to write. And to sleep and then write some more. They will spend this week and a half stuffing our eager young minds full of tools and tips and tricks and encouragement and reminders about craft. We'll have our own manuscripts critiqued and workshopped by our peers. We'll develop our curriculum with our faculty mentors. And then, next weekend, we'll find that our own tendrils of nerve endings and capillaries have spun out like webs and intertwined with the fine, yearning nerve webs of our fellow students, our colleagues, the only other people in the world (we're certain) who understand this drive we have to spill our guts on the page, the only other people, in fact, who we trust to watch that spilling and tell us how it could be done better the next time. Because the residency will be over, then, we'll be forced to wrench away, ripping the intricate web of trust and love and words apart, and go home to nurse those wounds, to try to remember what we were taught, and to write about all of it using all of those tools. In the meantime, I'm just getting to know my classmates, the follow members of my semester cohort, shooting to graduate in June of 2012 with a Masters of Fine Arts in Creative Writing. Our entering class is 30 in 5 different genres (fiction, non-fiction, poetry, writing for young people, and writing for stage and screen). Together, we'll suffer countless deadlines, all of which will probably seem impossible. But at least the whip will be cracking, and hopefully it will keep me, will keep all of us, working. Tonight we all attended our first public reading in the Marran Theater. These will occur almost nightly between now and the time we leave. They are open to the public, too. First up was poet and visiting writer, Sharon Bryan. My favorite of the works she shared was a poem titled Saying Things . It begins with Adam, the first man, on earth and "born blind." But a voice in his head is saying, "Open your mouth,/ let the words fly out." So he does. He says "scarlet tanager" and a brilliant bird appears. When he says, "Pine tree," the bird alights on a branch. Soon, Adam gets the hang of saying things and delights in the naming, but gets carried away. And soon he sees the first woman, Eve, who acknowledges Adam's hunger by setting out an apple pie to cool on the counter. Many of Bryan's poems carry this note of amusement, of irreverence, especially when it comes to God. But this same poem does end up with Adam's memories of lying in the dark with Eve, wishing he could go back to that period of first discovery. That's the kind of deeply entrenched thoughtfulness, plain spoken insight, all with a pinch of good humor, that I love in poetry. Tomorrow we begin our introductory workshops. And away we go!